← Back in Time Again. Again. Ok. I’m skipping the foreplay and the pleasantries. Get in my time machine. We’re going back one year exactly. And you better enjoy it. Paul became public enemy number one after Spain dismantled the young German team earlier in the week. Seemingly on the Fan Mile during and after the Spain game, fans turned against their former hero, singing anti-octopus songs. Newspapers reported on threats to Paul’s life. Even the Spanish Prime Minister was concerned, offering to send a protective team to guard the octopus. It’s only an octopus!! On my beer mission – sorry – I mean, on my journey for the essentials – I did notice that about half of the German flags that had lined the streets were gone (although the giant Holland flag of a neighbour was still proudly draped over their balcony). As I switched on the TV to watch the build-up, the show’s focus alternated between a review of the World Cup (as if it had already finished), and a review of Gunter Netzer’s career as a TV analyst. Some readers may remember him as midfielder for Borussia Mönchengladbach, Real Madrid and Germany (I don’t, although I had heard of him), but he is almost a cult-figure in German football broadcasting. Think Alan Hansen, but even grumpier. He argues constantly with the presenter, and often replies with one word answers. Perhaps his most famous moment in his second career was in 2003, when then-German manager Rudi Völler showered him with abuse live on TV after Netzer had criticised his team following a 0-0 draw in Iceland. So, I left the house an hour early to go to the KulturBrauerei in the centre of the city. Due to a lack of fore-planning, and running on gut instinct, I took us in the wrong direction several times, trying to connect to public transport routes that only existed in my head. We made it, stressed and hot (the temperature had dropped to 35 degrees), just in time for kick-off. A lot less German colours on display with Germany not making it to the final. Today. One year ago. Opened in 1842 as a brewery, and extended in 1878, the KulturBrauerei is now a complex of nightclubs and small businesses. 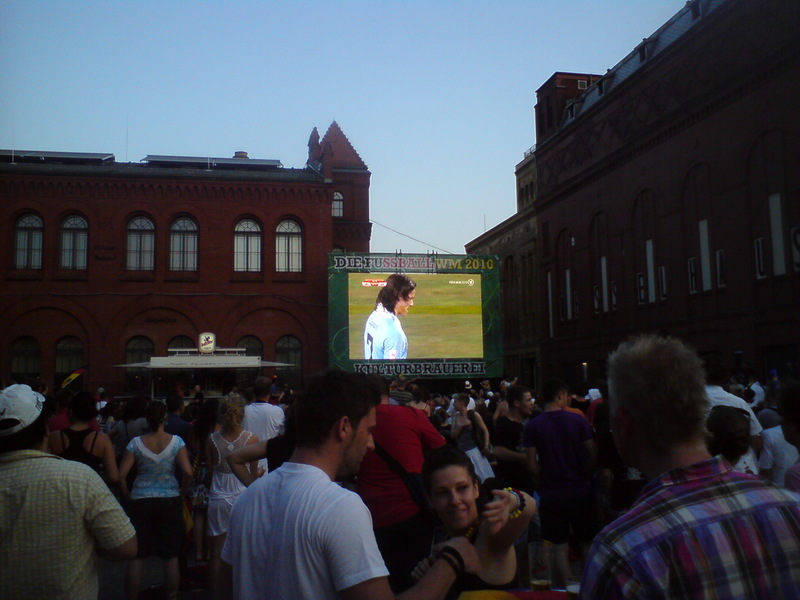 The screening was held in the large open space between several of the clubs. There were only about 400 people there (including a family of Uruguayans), and only about a third of the people there were dressed in German colours, and there were few flags present. There didn’t seem to be the sense of excitement, or even nerves, as there had been at the earlier games. It seemed more of a duty than a pleasure to watch their exciting young team, now that they could no longer win the World Cup. Anyway, onto the game that wasn’t a game. The match was very entertaining, but there was no real atmosphere at all, aside from when the goals were scored. Gone was the singing of previous games. 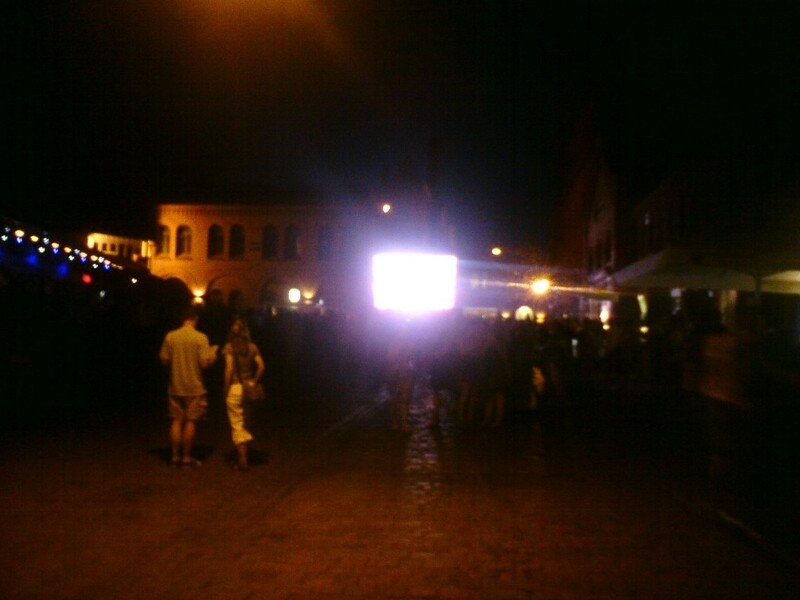 Obviously everyone wanted Germany to win, but no-one seemed to care that much. The emotions never peaked as high, or fell as low, as they had earlier in the tournament. It wasn’t until around the hour mark until the atmosphere started picking up, with a few songs and more cheering as the crowd seemed to sense that their World Cup would be over in half an hour (although judging by the lack of people there, I would assume many thought the World Cup had already ended when they lost to Spain). At the final whistle there was a cheer, and then people started to leave. It was a very anti-climactic end for the World Cup, for Germany, and certainly not the one many were predicting after the team destroyed Australia (and later England and Argentina). However this is a German team that the country can be proud of, having came 3rd for a second consecutive World Cup (with a runners-up place at Euro 2008), and one that will only get better as the young players develop. Perhaps this is Germany’s Multicultural Golden Generation coming through (although, as an Englishman, the term ‘Golden Generation’ brings back memories of disappointment and embarrassment). The World Cup ended for Germany tonight. One year ago. This entry was posted in Football and tagged Berlin, Berlin Fan Mile, Germany, Germany’s Multicultural Golden Generation, Gingers in the sun, Gunter Netzer is a grumpy Alan Hansen, KulturBrauerei, Paul the Octopus, Time Travel, Today, Uruguay, World Cup 2010. Bookmark the permalink.